Other Products: White Cardstock, Big-Shot Machine. Instructions: Card final size is 6 x 6". Cut two Festive Holiday Die on white cardstock and adhere on the card base on left top side and bottom right side as shown. Cut one eyelet circle die and adhere it at the centre of the card with foam tape to give some dimension. Stamp one Tulip Bouquet on white cardstock with archival ink-jet black, cut it with coordinating die and color it with Zig Clean Color Real Brush Markers. Stamp some Petals from Tulip Time on white cardstock using archival ink-vibrant fuchsia and cut them with coordinating die and color them with the same ink both inside and outside and shape them using 3D Tulip Shaping Mold. 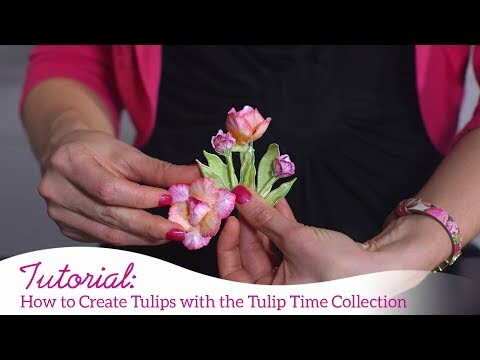 Stamp some tulip leaves with archival ink-library green on white cardstock and cut them with coordinating die and shape them using Flower shaping tool kit. Arrange these flowers as shown. Stamp Fence, cart and flowers from Tulip Cart and fence Cling stamp set with archival ink-jet black and cut them with coordinating die and color them with Zig Clean Color Real Brush Markers, as shown and adhere them with foam tape. Add sentiment from the Tulip paper collection and adhere it with foam tape on the right top side.